What’s happened to Matt Damon’s choice of films? The Martian (2015) showed everybody’s favourite everyman couldn’t put a foot wrong. Jason Bourne (2016) placed him back in his comfort zone and the safe hands of Paul Greengrass. But then came The Great Wall (2016) and those tell-tale signs of fraying round the edges. 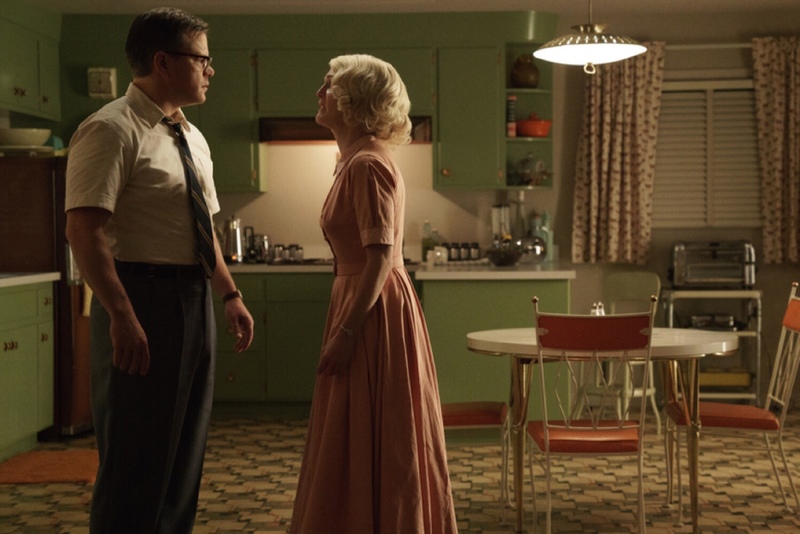 On paper, Suburbicon looks a safe bet – written by the Coen brothers, directed by George Clooney and with a cast that also includes Julianne Moore and Oscar Isaac. It’s got to be as safe as houses. Hasn’t it? They’re to die-for credentials, but they’re not without question marks. Clooney’s last offering as a director was the well-intentioned but deeply dull The Monuments Men. Even though Joel and Ethan wrote the script, they’ve chosen not to make the film themselves, so what does that say? And, of course, there’s Damon, who appears to have momentarily lost his touch when it comes to choosing his films. Suburbicon starts out in an almost identical way to his next one, Downsizing (released January 2018), with a promotional film extolling the virtues of a new life – in this case the gleaming, manicured new town of Suburbicon. It’s an idyllic place to live, exemplifying the sort of America that the current resident of the White House would approve of. Except that it’s all a sham, a place where just about everybody isn’t what they seem to be. The promo brags about diversity, but the reaction of the community to the first black family in the neighbourhood is shocking. And the residents’ association is all male. Gardner (Matt Damon) lives there, with his wheelchair bound wife (Julianne Moore) and young son. Then a couple of thugs break in, terrorise them and the wife’s twin sister (Moore again) and Damon’s wife is killed. You think you know why it’s happened. You don’t. The lives of father, son and aunt spiral out of control, especially when they’re paid a visit by the slick, mustachioed Oscar Isaac. The result is a literally bloody mess. It’s a film that doesn’t know what it wants to be. The racism inflicted on the black family is turned into a sub-plot, one that the film tends to ignore much of the time: when it gets an airing, it goes nowhere and has very little to say. Yet it’s a story that would make a film in its own right. So if it’s not a social commentary, what does Clooney have in mind? A 50s pastiche? It certainly re-creates the period with an eye for detail that Todd Haynes would appreciate, especially as one of his favourite muses, Julianne Moore, is on double duty. Yet it misses a trick by not filming it in black and white. Or is it tribute to 50s noir. There’s definitely a visual reference to Dial MFor Murder and there are echoes of Double Indemnity. It’s none of them. The only conclusion left is that he’s made a black comedy, but one with a disappointingly low laughter count. The target, when he hits it, is the dark heart of the nation – Suburbicon as a microcosm of America – which unravels at a rate of knots when the slightest thing is outside the norm. And the stellar cast look lost. Damon is solid enough as the father who, on the outside, is conventional and law abiding, but soon shows his true colours. Moore is hardly stretched, even when she’s doing her double role. The best performance by a mile comes from Oscar Isaac, who only shows up an hour into the film and doesn’t hang around for very long. It’s not enough. If Matt Damon seems to be on a downward slide, director Clooney is following right behind him. The directing chops are there – The Ides Of March, Goodnight And Good Luck – but they’ve not been on show for a while and they don’t return in Suburbicon. There’s the distinct sense he wouldn’t want to live in the town. You won’t want to stick around there either.